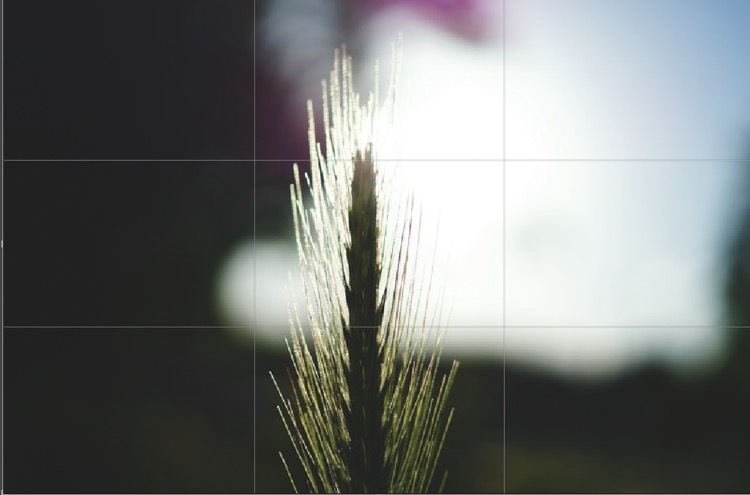 Have you heard about the rule of thirds yet? It’s one of the cornerstones of good photography composition, and it’s really simple to learn. 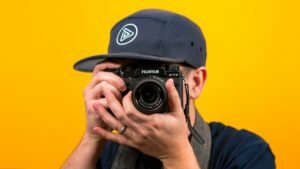 Most beginner photographers put their subject right in the center of the photo, either because it comes naturally to center things, or it’s the way they’ve been taught. The rule of thirds can make an enormous difference in how your photos look. The rule of thirds is derived from the golden mean, which is a composition and ratio guideline based on the Fibonacci sequence. This is where art and math intersect, and it’s been around for hundreds of years. Artists based their compositions on it, and there is a mathematical equation for it. It’s also found naturally occurring in nature – think of the spiral patterns of snail shells or pinecones. For those of us who are not mathematically gifted, (that includes me!) I will attempt to explain the rule of thirds in a way that’s easy to understand and put into practice. In your camera viewfinder, you will see a rectangle when you look through it (unless you are shooting with a different format, such as a square frame. This would be divided into smaller squares.) This is the frame for you to fill with your image. Imagine that rectangle split into a grid of nine equal rectangles by four intersecting lines. Two of the lines cut your frame into thirds vertically, the other two horizontally. 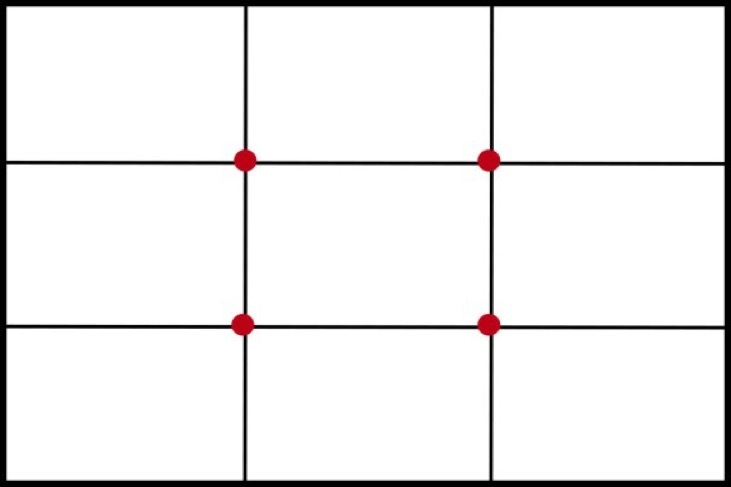 The grid below shows how it looks. 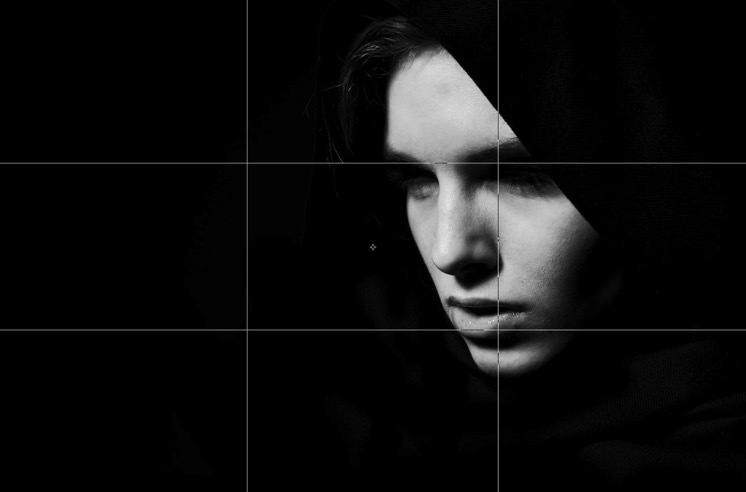 For taking portraits, you would simply flip the grid around and stand it on its side. How Does This Grid Help Me Compose My Images? Decide what the main focus of your image is. Is it the horizon? A fence in the foreground? Someone’s eyes? By placing principal elements of your intended image at or next to the places where the lines meet, you automatically create a ratio that’s pleasing to the eye. So, if you are taking a photo with the horizon in it, you would ideally place the horizon line along the top third or the bottom third of the image. It works equally well for portraiture too. If you are shooting close-ups, for instance, try placing the subject’s eyes in of one of the places where the lines cross in the top third. Having the eyes above the line in the top third of the frame also works. You can also place the eyes along one of the lines. So, by having the eyes in the top third of the frame, it gives a pleasing balance to the image, like the one below. Of course, not all images will wait around until you’ve lined them up perfectly with your mental gridlines, but keeping that rule loosely in your head while you’re composing your shots will help. When it’s not possible to hit the rule of thirds in camera, photographers often crop in Lightroom or Photoshop to make it look better. That’s why the crop tool in both of those programs has a thirds gridline which superimposes across your image when you use it – so you can move your image around to find the most pleasing crop. In Photoshop, if you click the grid icon along the top of the toolbar when you are on the crop tool, you can choose the style of grid you want, including rule of thirds, golden spiral etc. 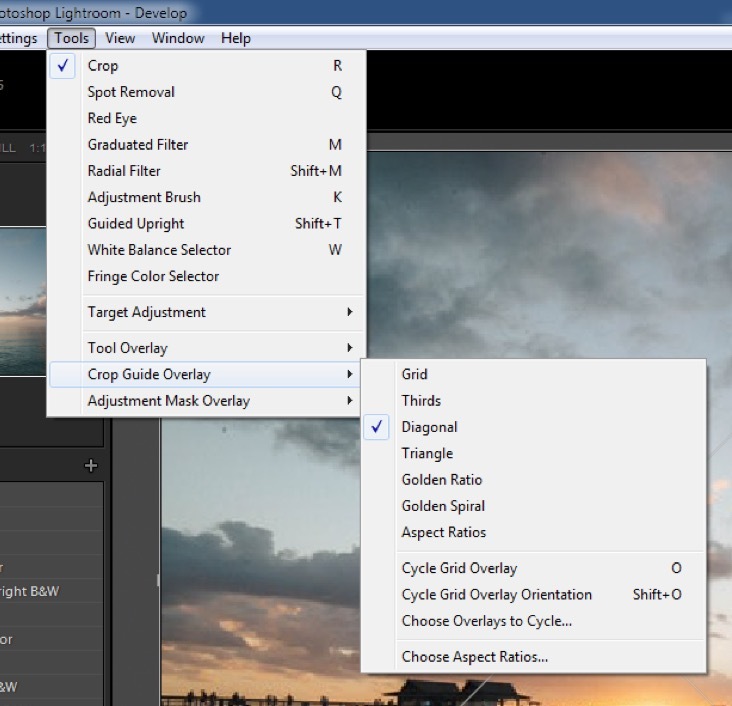 With Lightroom, the thirds grid is found in the tools menu, as in the screenshot below. To learn more about editing photos, take our complete Lightroom or Photoshop courses. Or, you can get access to 75+ courses by joining our monthly membership: click here to get your first month free! This rule of thirds thinking starts to come naturally to photographers. Soon you will be able to look at an image and just know if it looks right compositionally, or if there is something ‘off’ about it. You can develop this skill by finding images that you really like and seeing if they follow the rule of thirds. 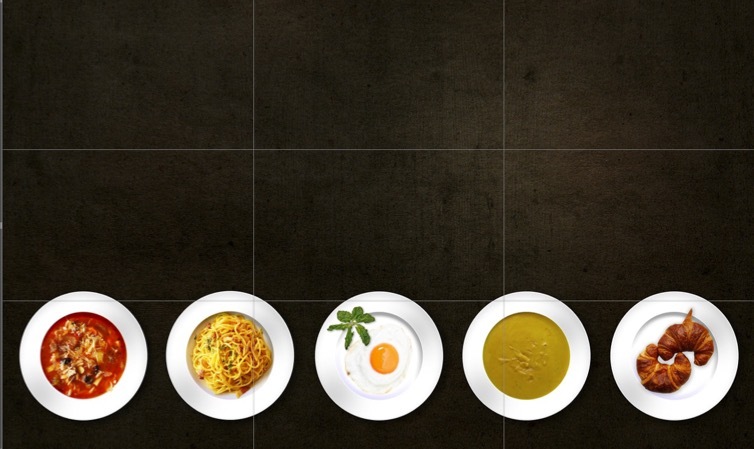 This food photograph below is a great example of using the rule of thirds and negative space to make an impact. Negative space is the empty space around an image, and it can really make an image stand out when used properly. You don’t have to fill the frame every time to make a great image. The image below of a seascape and sky fits the classic rule of thirds composition. 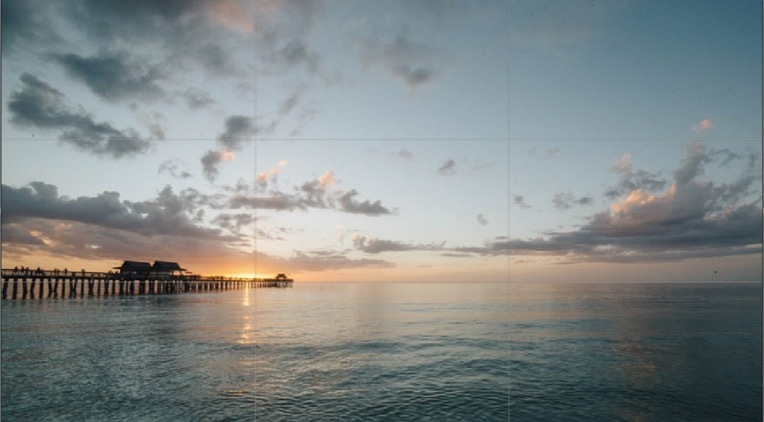 The lower third gridline is lined up with the horizon, and the pier is in the left hand third of the screen, also following the lower gridline. The portrait below shows a powerful use of rule of thirds. See how the intersecting lines in the top third of the grid meet across the subject’s eye? The lines also cross on his mouth too. I think this is a great example of using the rule in portraiture, combined with good use of negative space. Must I Always Follow This Rule? Absolutely not! As you develop your eye, you will simply compose and shoot without thinking too much about whether you’ve lined your subject up with the gridlines. Most experienced photographers just know the moment they take the image whether it’s a great one or not – it doesn’t matter if you’re using a prime or zoom lens. Sometimes breaking the rule deliberately can make fantastic photographs, too, as in these photos below. The main subject of the image above is right in the center, with lots of empty space to the sides. It doesn’t follow the rule of thirds, but it still works. The image below is a very powerful composition, but it doesn’t strictly follow the rule of thirds. The model is dead center in the frame, but it works because of the starkness of the background. Also note that the image does actually use the rule of thirds in one place – with the rocks in the bottom of the photo. They start coming into the image on the bottom third gridline. The key is knowing exactly when to break the rule of thirds, and how to use that to significant effect. To break it successfully though, you must first understand how to use it. That’s why it’s worth learning about. I rarely compose images in camera using the rule of thirds grid. I can just feel if a shot is right or not, and chances are when I lay the crop tool on the image in Lightroom, the important elements will more or less match up to the gridline intersections. With practice, you will get to this stage too. Experiment. See what works and what doesn’t – that’s the only way to learn. Most of all, have fun with it! The rule of thirds is only part of good composition, though. Master it, and you can then learn all about leading lines and creating triangles in your images to make them even stronger visually. For more inspiration, check out this article How to Experiment with Photography Composition.